Birthdays often have problems. Whether it’s the annual reminder of impending mortality, Grandma getting you the totally the wrong Teenage Mutant Ninja Turtle action figure or Marilyn Monroe failing to jump out of your cake to wish you happy birthday. (Actually, regarding that last one, it would create a whole bunch of additional problems if she did. So stop wishing for that. Among a group of randomly-chosen individuals, what is the probability that at least two of them will share the same birthday? The “randomly-chosen” bit is key, of course, since including certain individuals would muck up the math. The Olsen twins, for instance, would totally ruin everything. How many people do you need to have a better than 50% chance of two people sharing a birthday? That’s a trickier question than it looks. Most people can narrow down the range of possible answers a bit. If there’s one person in the room — scary Olsen or not — then there’s zero chance of sharing a birthday with the nobody else in attendance. And if (ignoring leap days, because ain’t nobody got time for that) 366 people are mingling, then the chance is 100% that at least two of them share a birthday. There’s only so much calendar to go around. You might think that the number to get 50%, then, would be right in the middle. You would be mistaken. Then again, a few minutes ago you wanted Marilyn Manson to hop out of a cake and sing to you. You don’t exactly have a track record for making good decisions. The real answer (spoiler alert!) to this version of the birthday problem is 23. According to combinatorics probability theory — and some nifty math — with just 23 people in a room, the odds are slightly better than 50% that two of them share a birthday. If you want to increase the odds to 99.9%, you’ll have to make a few more phone calls — but your meeting hall still only needs a capacity of 70 people. That’s nothing. They get bigger crowds than that at the Pawnee, Indiana town hall. 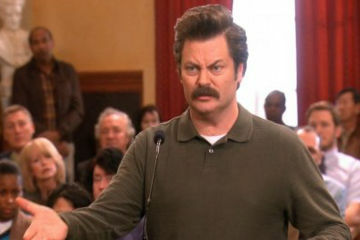 And Ron Swanson doesn’t share his birthday with anyone. This surprising result to the birthday problem is important for three reasons. First, maybe it instills in some young minds a wonder and love for math, and they’ll go on to become professional mathematicians. Which is great, because somebody has to take that bullet. And numbers make my head hurt. Second, there are computer hacking strategies — called “birthday attacks” — that take advantage of the math behind the birthday problem to wreak certain kinds of digital havoc. These brute-force cryptographic manipulations are often aimed at using hash collisions to the hackers’ advantage. In other words, no birthday cake for you. And finally, this demonstrates that there’s a big difference in calculating a 50/50 that any two people will share a birthday, versus the same odds that somebody in a crowd shares your birthday. For the latter, you’d need at least 253 people, which reminds us that probability is tricky, the obvious answer is not always the right one, and for crissakes stop making everything about you, ya town hall-cramming Olsen-loving Manson-caker. And oh, yeah: happy birthday. Freak. Chemical elements are exactly like people: there are almost two hundred of them, and only a handful you’d want to invite to a dinner party. The other way elements are like people is that they both have baggage. With people, it’s a messy divorce, or a predilection for making their pets wear sweaters. 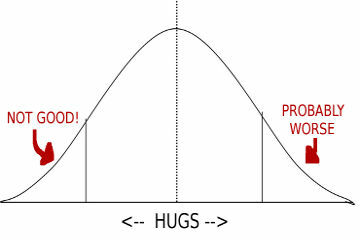 Or being an outlier on the Bell curve charting “frequency of parental hugs”. With elements, it’s neutrons. Nothing else. Just neutrons, little uncharged subatomic bits of schmutz. You would think that would take all the drama out of having baggage. You can dump extra neutrons onto an atom, no matter how small. Take hydrogen, for example — the runtiest little element of all. It’s got just one proton — the other bit of atomic schmutz that has a positive charge, to offset the negative electron circling the nucleus — and no neutrons at all. Hydrogen is simple that way, like a monk or a wise old hermit or that kid who used to shine shoes on Parks and Recreation, before he got married and buff and went into outer space with that tree and the rodent and the rest of them. You can pile a neutron onto a hydrogen atom, and it’s mostly fine. This atom is called an isotope, because it’s got more (or less) than the usual number of neutrons — and it’s called deuterium, because that’s what hydrogen atoms with one neutron like to be called. But deuterium, laden with baggage though it is, is very stable. Makes good decisions. Keeps a steady job. Probably doesn’t even have a therapist — unless it lives in L.A., because pretty much everybody has a therapist there, but still. Deuterium isotopes are chill. Until you feed them another neutron. Then those isotopes become tritium, which is a radioisotope. And radioisotopes are atoms where the baggage has gotten to be too much, and it gets unstable. These are the atoms with the crazy eyes, and — like most anyone with too much baggage — they’ll eventually dump it out on those nearby. Explosively. For radioisotopes, this means radioactive decay — a release of stored energy which brings the atom into a more stable state. Tritium, for instance, decays into an atom of helium-3 (two protons, one neutron), which is completely stable, and fine to invite over for parties or to babysit the kids. But the energy and particles released by decaying radioisotopes can be bad news — or extremely useful, depending on the atom. Some forms of radioactivity can cause radiation poisoning, cancer or fish with an uncomfortable number of eyes. The rate at which radioisotopes blow their atomic stacks is measured as a half-life — that is, the amount of time it takes for half the atoms in a sample to go completely batshit and decay. Knowing this half-life (and the type of decay — alpha, beta, gamma or other) can come in handy where just the right amount of radioactivity is helpful — like americium-241 used in smoke detectors, or gadolinium-153 used for certain kinds of X-ray tests and osteoporosis screens. But the most temperamental and energetic radioisotopes — the Kardashians of the atomic world — can cause problems for centuries or longer. Carbon-14 and strontium-90 from nuclear bomb tests, for instance, with a half-life of nearly six thousand years, or nuclear reactor output like cesium-137 and iodine-131 (which can also be used as a cancer treatment, under carefully controlled conditions). So the next time you decide to dump baggage on someone — or unload some of your own on innocent bystanders — take a moment to think of the radioisotopes. Some of them are just as unstable as you. Only they wig out and break down because of science, and not a tragic hug imbalance. Neat.